June 6, 2018, Thekchen Chöling, Dharamsala, HP, India – The yard around the Tsuglagkhang was packed with people when His Holiness the Dalai Lama walked out through the gates of his residence this morning. The estimated 9000 people included 900 college students, 112 students from the Men-tsee-khang, 105 students from the Tibetan Transit School, nearly 1400 students from TCV schools—mostly from classes 9-12, 250 from the Dharamsala Buddhist Study Group, more than 2000 interested people from abroad, including 150 Thai monks from the Thai Dhama-Sala Charitable Society, and local Tibetans. Smiling and waving to members of the crowd as he went, His Holiness made his way up to the temple. There he paid his respects before the statue of the Buddha and greeted old friends before taking his seat on the throne. Members of the Dharamsala Buddhist Study Group, comprising men and women, monastics and lay-people, Tibetans and people from abroad, demonstrated their debating skills. The first group discussed the aspiring and venturing awakening minds as described in the ‘Guide to the Bodhisattva’s Way of Life’. The second group explored modes of reasoning as revealed in Dharmakirti’s ‘Commentary on Valid Cognition’ (Pramanavarttika). Dispensing with a long recitation of prayers His Holiness recited two short verses before beginning to address the gathering. “We’ve been holding teachings for young Tibetans at this time of year when children from distant schools and colleges could also attend for several years now. So students and school children are the main disciples on this occasion, but I am also glad to welcome monks from Thailand. “The Buddha attained enlightenment in India more than 2500 years ago. The explanation of the Four Noble Truths and their sixteen characteristics that he gave in Sarnath, Varanasi, was his fundamental teaching. Later, he elaborated on this in the teachings he gave on Vulture’s Peak. “The Thai monks here are senior to us as students of the Buddha. They follow a tradition of monastic discipline or Vinaya preserved in the Pali language. We in Tibet follow a tradition preserved in Sanskrit. There are some differences in the number of infractions and the precepts held in these traditions, for example in the Theravada tradition one precept enjoins a monk to wear his robes properly, whereas in the Mulasarvastavadin tradition seven precepts are stipulated with regard to the wearing of robes. In terms of the spirit of the Vinaya we share essentially the same traditions, however the Perfection of Wisdom teachings we Tibetans uphold are specific to the Sanskrit tradition. “I greatly appreciate the presence of these Thai monks and other followers. In the past there has been little contact between members of the Pali and Sanskrit traditions despite efforts to encourage it. In the 1960s, I sent some Tibetan monks to Thailand where they stayed in monasteries and observed the Theravada vows, but the arrangement could not be kept up. We are hoping to resume it and a first step will be for monastics from each side to learn the other’s language. His Holiness mentioned the array of religious traditions preserved in India, some indigenous like the Samkhya, Jain and Buddhist traditions and the Abrahamic traditions like Judaism, Christianity and Islam from elsewhere. All these traditions emphasize altruism. They teach about love and compassion. He observed that since all have been of service to humanity in the past and will continue to be in the future trying to set them apart serves no purpose. He recommended that people make an effort to cultivate respect and harmony among them while upholding their own faith and declared that India has shown over a long period that this can be done. His Holiness conceded that there are philosophical differences among these various traditions—some are classified as theistic, believing in a creator god, while others are not. One branch of the Samkhyas, Jains and Buddhists do not assert a creator, but among them only Buddhists deny the existence of a self independent of the psycho-physical aggregates. He remarked that among different Buddhist schools of thought, all assert a selflessness of persons, that there is no single, independent self functioning like a controller of the aggregates. However, only some, the Mind Only and Middle Way Schools, also speak of a selflessness of phenomena. 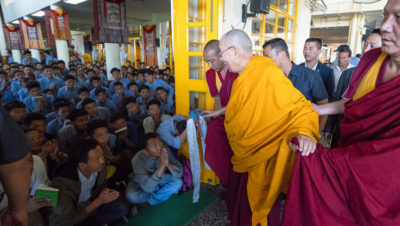 “In today’s world people abuse and kill each other, despite scientists observing that basic human nature is compassionate,” His Holiness observed. “One reason seems to be that modern education is more focussed on achieving material development than on cultivating our basic human inclinations towards compassion. “In Tibet, the Nalanda Tradition of Buddhist study and practice were introduced thanks to the religious Emperors. The great scholar Shantarakshita established Buddhist teachings while Padmasambhava overcame obstacles. Shantarakshita encouraged the translation of Indian Buddhist literature from Sanskrit into Tibetan as we see reflected in the colophon to the ‘Guide to the Bodhisattva’s Way of Life’, which shows that three different teams of scholars and translators, at different times, worked to refine the edition we have today. “This year I suggested we look at the ‘Guide to the Bodhisattva’s Way of Life’. If you are restless and despondent, reading Chapter six can calm you down. Similarly, due to self-cherishing attitudes our minds are easily disturbed. Remedies can be found in Chapter eight with its focus on meditation and the cultivation of the awakening mind of bodhichitta. “In 1967, when I came across Khunu Lama Rinpoche’s ‘Jewel Lamp’ I asked him to teach it to me. After teaching me the‘Guide’ he asked me to explain it to others whenever I could. He told me that Shantideva composed it in the 8th century and that there has been no greater book dealing with bodhichitta since then—this is the essence of the Buddha’s teachings. During an intermission His Holiness answered several questions from students in the audience. When the session resumed, he began to read ‘Guide to the Bodhisattva’s Way of Life’ steadily from the beginning. Pausing to make occasional clarifications, His Holiness completed the first four chapters and was well into Chapter Five when he stopped. He will continue his reading tomorrow morning. Walking down from the temple, as is his wont, His Holiness greeted old friends and new, smiling, waving and shaking hands, before climbing into a car to complete the journey home.